The Master of Science in Anatomy (M.S.A.) program is designed to be completed in 24 months but can take up to five years to be completed on a part-time basis. The curriculum includes first-year medical school classes, courses specifically designed for the anatomy master’s degree program and an extensive requirement to teach anatomy by assisting the anatomy faculty in this noble craft. The M.S.A. program provides advanced training in anatomy and is designed to prepare students for a professional career in academic teaching. 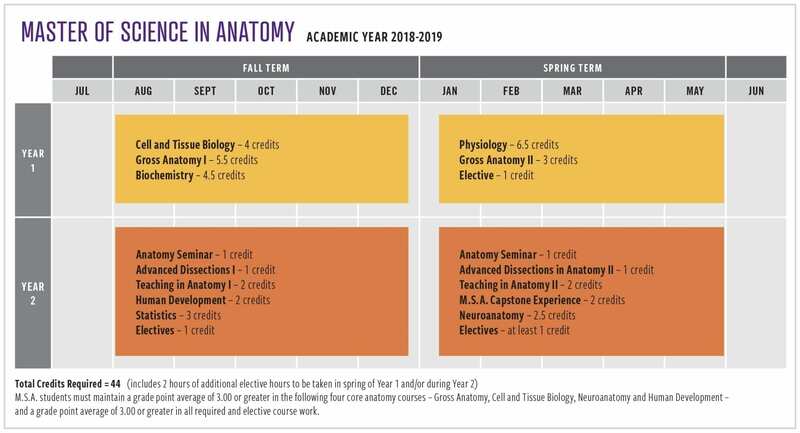 Educators and scientists who wish to further enhance their careers as teachers of the anatomical disciplines will also benefit from this program. To demonstrate knowledge of biochemical and physiological concepts and principles. The Program has anchored its five learning goals to those at the level of the institution as developed by the University Student Learning Assessment Committee.